Bicycle and pedestrian travel is vital to the region's public health, transportation, and the economy. CDTC believes that encouraging bicycle and pedestrian travel is a socially, economically, and environmentally responsible and healthy approach to improving the performance of our transportation system. At CDTC, possible bicycle/pedestrian related improvements are considered from the perspective of developing a system - not just based on whether a particular facility is currently used. 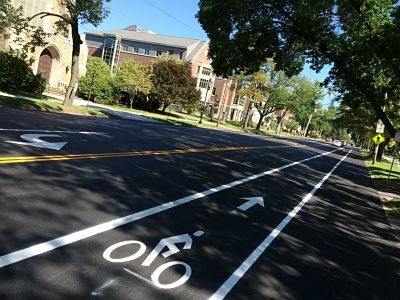 A system of sidewalks, bike lanes, and trails will encourage safe bicycle and pedestrian use and will increase accessibility for all residents and users of the transportation system in the Capital Region. 2. Increase the number of bicycle and pedestrian traips (especially commuting trips) in the Capital Region. 3. Reduce obesity rates, heart disease, and other chronic illnesses in the Capital Region. 5. Increase funding for bicycle and pedestrian projects, particularly on the on-road portions of the bicycle and pedestrian priority network. For more detail on these goals and how they were developed, please see the CDTC New Visions Bicycle and Pedestrian Action Plan.